Evicting a Tenant in Stockton California is a time consuming and costly process. How do I Evict a Tenant in Stockton California? What Every Landlord Needs to Know! Some say time and money solve all real estate issues. In the case of an eviction in Stockton CA, it will most likely cost you both and then some. As landlords we know that when it comes to rental properties in Stockton CA and tenants are present anything can happen. We affectionately refer to the land-lording process as managing”Tenants and Toilets. The gamble is always which one will breakdown first. While plumbing can be costly too, it is always the tenant that has the potential for causing the greatest amout of damage and frustration. When you are confronted with a bad tenant the thing to keep in mind is what you want to accomplish. I have been a landlord for many years, you know that no matter how effectively you screen your applicants to find the perfect tenant, sometimes you just don’t get it right and it becomes necessary to evict the tenant. It is important for a landlords with rental properties to know that the eviction process is a legal one and most of the the rights are in the tenants favor right up and until the time of the court hearing.Until that time it is your burden to make sure that you do everything in your power to secure your property without infringing on your tenants rights. Fortunately we still have some tools in Stockton California that can remove a bad tenant even if it seems to take forever and cost a fortune. While an eviction is the most onerous of the choices for both the landlord and the tenant, it is effective and just takes time and money. Alternatives to eviction are at a landlords disposal and can have a more favorable to a positive outcome. We will discuss Two such options later in the article. How do I Evict a Tenant in Stockton California? In order to effectively litigate an eviction all of your paperwork must be in “perfect order”. Trying to handle all of the notices and filings yourself is a mistake as even one clerical error and you can lose the case and the clock starts all over again. 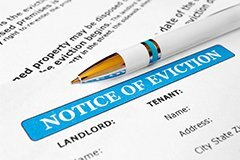 There are Several Notices that need to be delivered when Evicting a Tenant in Stockton. As I said earlier, today’s tenants have more rights than their owner landlords in Stockton, California and the attorneys that represent these tenants know this and know exactly how to win. 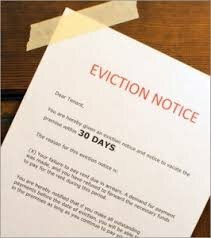 Don’t be enticed during an eviction to accept any money whatsoever from a tenant that you are trying to evict. As tempting as it may be, if you want them out it will kill your filing and they will win in court. Your attempt to mitigate your losses will backfire and a good attorney will use that payment against you. According to California Tenant Law: every I must be dotted and T crossed and until you get into the courtroom the tenant has all of the rights. From a landlord perspective the deck is stacked against you. “Contrary to popular belief, winning a case over nonpayment of rent is actually the easiest for the tenant to win: a defective notice, prior illegal late fees or repairs that you made, uninhabitable conditions that exist now, unsatisfied citations by the building or health department, illegal structures, unlicensed managers, unregistered fictitious business names, miscalculations, waivers, special agreements with the prior landlord, unsigned leases, confusing lease languages, illegal lease terms, rent control requirements,…the list goes on and on. One little mistake in the landlord’s case and the tenant wins, even if the real reason the tenant didn’t pay is because they didn’t have the money”. The Cost of Eviction in Stockton keeps rising the longer you wait. So why would anyone want to become a landlord in Stockton, California? Especially if the system favors the tenant, the attorneys that represent the tenants know the loop holes and specialize and your cost of eviction is so high? I have talked to many landlords that have decided to get out of the business altogether as a result of those cost. Adding to those cost are new federal regulations recently released by HUD that make it illegal to discriminate against a renting to tenant because of criminal background or other reasons they deem discriminatory. It is easy to calculate the real cost of an eviction based on a average timeline of how long it may take and then when you add in lost rent, damages, repairs, vacancy, cost of eviction, cost of unit turn over, time, leasing costs, the risk of leaving a property vacant, are taken into consideration the costs can add up fast. Let’s look at a typical house and assume that the rent is $1,000.00 per month. Let’s assume that your tenant is already two months’ behind in rent and for our purposes, were going to add an additional month as a “Lost Months’ Rent” as it will take some time fix and re-rent the property. Taking into account the cost of cleaning the unit and prepping it for the next tenant, paying the leasing agent, paying for marketing and concessions, it’s apparent an eviction is very expensive. It’s important to understand that this is likely a best-case scenario. It may take substantially longer for the tenant to vacate and for a landlord to find another tenant. This estimate also does not take into consideration any damage that the house has suffered by the tenant or while the house is vacant. The cost of an eviction in Stockton California can easily wipe out any profit for the landlord. No matter how much due diligence you do and even if you have a property manager, it’s important to know that the cost of an eviction can easily get out of control! There are things that you can do to avoid an eviction and remove the tenant with a more proactive approach. One such approach is known as cash for keys. I have effectively paid tenants to move thereby mitigating my losses and allowed both of us to move on with our lives. They get what they want… moving expenses and I get what I wanted… them out. Most of the time I have accomplished that by just splitting the difference of the cost of eviction and offering the tenant half until I find the magic number. Keep in mind, that you cannot make any payments whatsoever to the tenant directly. In this scenario It’s OK to pay the new landlord directly without giving any money to the tenant. 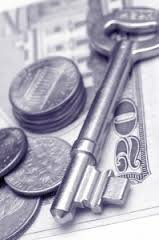 You get to create the rules and written agreement so that the results are what you want… the keys in your hand. There is also another alternative as well and if you are a landlord that has just had enough, then we can buy your house in Stockton, pay cash and let you get on with your life. My name is Peter Westbrook and I am a local real estate investor in Stockton, California. We buy Houses in Sacramento, Stockton and Modesto Ca. If you are tired of being a landlord and just want to sell your Stockton houses, and invest your money elsewhere, I can help. We are cash home buyers in Stockton and we pay cash for houses. We can even Buy Your Stockton House so that you can avoid Capital Gains by structuring the sale in such a way that the payoff is deferred through escrow. There are many things that we can do to allow you to walk away with your investment secured but without the headaches of another bad tenant. Call me today at (209)481-7780 or visit my We Buy Houses Stockton Website and fill out the short form. Either way you will talk to me personally. At “Westbrook REI” and “We Buy Houses Sacramento”, we are the best at what we do because we work at it every day. We understand that a commitment to customer and a commitment to our business only happens with hard work. We have years of experience and a plan that we follow. We are a real company with real people that are committed to helping you achieve your goals. There is a very important post that you share.In this article, you share excellent topics.